In order to ensure food safety and quality, the Italian chain fresh supermarket "Cooper" spent 100,000 euros to purchase the latest gas chromatograph, analyze food ingredients, pesticide residues, and eliminate fake counterfeit products. The Italian diet is world-famous. To ensure quality and reputation, the laboratory at the Coop Italia supermarket purchased the latest generation of gas chromatography from France. 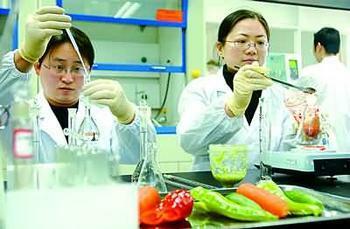 Gas chromatography can be applied to food management. Because of the unique nature of the substance's gas phase, such as human fingerprints, gas chromatography accurately and quickly identifies the presence of a single substance and then assigns one ID to each food. Maurizio Zucchi, director of quality management at Cooper, said that there are already many gas chromatographs in Italy, but most of them are in research institutions. Cooper was the first supermarket to purchase this equipment. Zhu Qi said that last year I heard that France has developed the latest generation of gas chromatographs that can accurately analyze the composition of foods. We have brought various samples to test in the past and found that this machine can not only identify the most frequently counterfeited minor ingredients, proportions, and even Can also identify the different origins of olives. Zhu Qi said that many foods in Italy are guaranteed to have production areas. This machine can identify the characteristics and origins of olives, grapes and yeasts and produce fake products. He said that wine and olive oil are the most often counterfeited products, such as water in the wine, or in the extra virgin olive oil to add lower grade oil. Zhu Qi also said that gas chromatographs can also suppress counterfeit organic products because they can detect residual chemicals and pesticides. â€œCooperâ€ is a large chain fresh food supermarket headquartered on the outskirts of Bologna. It has more than 1,400 branches in Italy, 7 million members, and an annual turnover of nearly 13 billion euros.